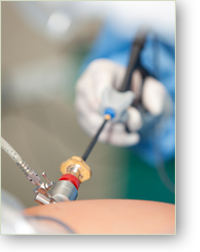 NOSCAR A joint initiative supported by the American Society for Gastrointestinal Endoscopy (ASGE) and the Society of American Gastrointestinal and Endoscopic Surgeons (SAGES). It is unique in one’s career in medicine to see a true paradigm shift that significantly changes patient management. This generation experienced such a paradigm shift with the introduction and development of laparoscopic surgery. It is possible that we are on the verge of another paradigm shift – Natural Orifice Translumenal Endoscopic Surgery (NOTES)®. To address this emerging technology, a working group consisting of expert laparoscopic surgeons from the Society of American Gastrointestinal and Endoscopic Surgeons (SAGES) and a group of expert interventional endoscopists representing the American Society for Gastrointestinal Endoscopy (ASGE) came together for a meeting in New York City in July 2005. This group identified itself as the Working Group on Natural Orifice Translumenal Endoscopic Surgery, later the NOSCAR Joint Committee. The overriding goal of the meeting was to produce a document that would serve as a guide for the responsible development of NOTES®. This web site contains information on the NOTES® process and the related activities of the NOSCAR group. This site will provide updates on the programs and activities developed by SAGES and ASGE on this important initiative. We invite you to check it regularly for updated information and materials related to the NOTES® process.